ABC, NBC, The New York Times, The Washington Post, The Associated Press and Reuters are banding together to test news drones. The TV news drones tests will be conducted in Virginia as part of a partnership with Virginia Tech. Interest in drones for news gathering has been growing since not only are drones a less expensive and safer alternative to helicopters, but also can be used in situations where it would be impractical for a chopper to access. 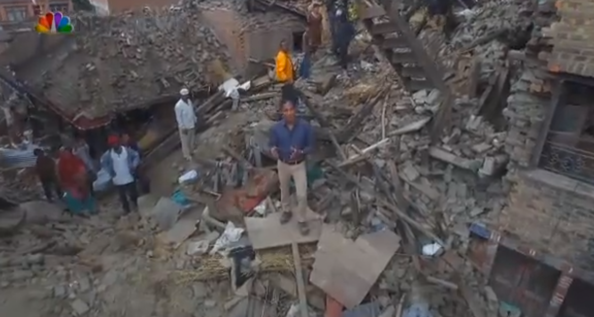 NBC, for example, used a drone when covering the cyclone damage in Vanuatu (shown above) as well as the earthquake in Nepal earlier this year, while ABC took drones to a remote part of the world during sweeps. Notably these applications took place outside of the U.S. and therefore out of reach of FAA regulations. Many local stations are experimenting with drones as well, but mostly contract with third party providers who have FAA approval to use drones for commercial purposes such as TV news coverage. ABC O&Os in Chicago and New York have even taken the steps of branding their drone coverage under the “DroneCam” banner. The FAA, meanwhile, is wrestling with establishing rules for drone use for all sorts of commercial applications, ranging from TV news to delivery services and more.